Cut and stack? Pressure sensitive? Shrink sleeve? See what Inland Labels’ CEO had to say about each option before labeling your next craft beer. Craft beer label decisions go well beyond the graphics. The material, the finish, the cut, the adhesive and the adhesion method all need to be considered for utility, look and cost. Inland Label hosted a two-part webinar to break down these options, and Craft Brewing Business listened in to see what Inland Chief Executive Officer Mark Glendenning had to say. “Labels are that rare piece of advertisement seen 100 percent of the time. Try to bring innovation into play; tie it into your branding. Also, design to the container. Too often we see art designed flat and not to the container,” he said. First label question facing a craft brewer: Do you want cut and stack, pressure sensitive or shrink sleeve? According to Glendenning, Cut and stack labels are still the most widely used option in the industry because of the cost efficiencies gained ordering them in large quantities. But pressure sensitive, a mid-tier label in terms of cost, is gaining share, growing about 3 percent a year. 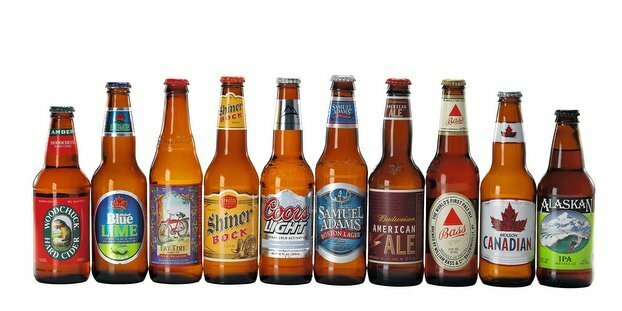 Shrink sleeves, the highest cost option for a brewer, has shown a 6 percent pick up and is the fastest growing, but still significantly lags in overall market share among the three. Cut and stack labels can be applied at a very high speed, up to about 1,500 bottles per minute, with either hot or cold glue. Cut and stack labels are versatile, with an entire library of paper and film options, and nearly an unlimited selection of shapes for both bodies and necks. For application, the labeling machine usually consists of two circles: One that spins the labels through glue application and another that spins the bottles into the freshly glued labels for application. The labels are removed from the first circle by gripper fingers and are placed onto oncoming bottles from the second circle, which then move through a series of brushes for smoothing and wiping down. Cut and stack labels can be applied at a very high speed, up to about 1,500 bottles per minute, with either hot or cold glue. The downside here is the front-end capital expenditure for implementing such a labeling system. Your labeling equipment will dictate the type of label you run, but new labeling equipment is making all of this easier, according to Glendenning. Newer labeling equipment is modular, which will allow a unit to bolt onto a machine, run cold glue for a few days, and then unbolt for completely different run, like pressure sensitive. Pressure sensitive labels are a middle-cost option, but when taking into account application and adhesive expenses, they are often a more cost-effective option overall for craft brewers. “With pressure sensitive design, get good glass with a consistently good surface. It’s a limited amount of adhesive to smooth across and it’s susceptible to voids and pits and problems on the glass. It’s more likely for opaque bottle labels to have wrinkles, and for clear bottles to have wrinkles and/ or bubbles.” — Mark Glendenning, Inland chief executive 0fficer“Pressure sensitive are well-suited for entry-level labeling,” Glendenning said. The reason is the labels come with adhesion pre-applied to the substrate. Pressure sensitive labels are essentially stickers, thus removing the extra glue and application expenses. Versatility of pressure sensitive labels in terms of shape, size, material and film is similar to cut and stack. Pressure sensitive costs more because the liner that winds up the roll makes it a six-layer product versus cut and stack’s four layers. Pressure sensitive costs will also increase as speed increases. If you need more bottles per minute, you will then need a material for the liner that helps it withstand the added stress of the faster machine. If you have the machine in house, costs go up there as well as the machine will need better tension controls at higher speeds. More risks and a higher cost, but shrink sleeves look pretty awesome when done right. Shrink labels are, well, sleeves that shrink. The film is highly engineered with shrink-extraction properties in order to ensure that it shrinks onto the package in a predictable way. That amount development and production drives much of the cost. Cans are the more friendly option for shrink sleeves because they are simple. Bottles have shoulders and lips and subtleties that create more careful shrinking considerations. Shrink sleeves have also been known to break glass from time to time. Application of a shrink sleeve is typically done by a specialist and not at a brewery. The advantage of the shrink sleeve is the 360-degree branding opportunity. “In markets outside of beer, companies have lowered their overall container costs by using a cheaper or less attractive container because the shrink sleeve is covering the entire container with branding,” Glendenning said. The shrinking of the sleeve is brought on by heat, which is important to remember if you happen to be storing rolls of shrink sleeves. Stored in a hot location, by the time they are pulled out, they may already be shrunk. Don’t let the costs and graphics dictate your entire label decision. Every variable will affect the substrates, coatings and adhesives you will need. The environmental impact of your label design. If you are concerned about sustainability, you will probably want a square cut label. Labels are based on squares. If you want a curved label with a curved neck, those are being cut from a square, sending the surrounding material into the trash. The curvature of your bottle’s neck. Know where the overlap is for a full-wrapped neck. If you don’t have those measurements just right, the label ends won’t connect and it will look like a mistake. The end use of your label. How is it being shipped and sold? Who is likely consuming it, and where? When? If you plan on this bottle going to a freezer or an ice bath, you will need a more aggressive adhesive. The best way to navigate through all of these considerations is with consistent, quality communication with your label supplier throughout the design and procurement process. For more information, be sure to check out Inland Label and listen to the webinar series for yourself. http://craftbeerlabel.com/ is committed to delivering an affordable low cost branding option regardless of the product placement. We will deliver a nicely printed digital label or sticker for your professional or personal use. Being a home brewer, this is where I buy all my labels for small batch brewing! They’re colors are always right on with my Pantone choices, and can hit any amount of detail I want to see. RT @BrewandCovered: Do u like cut & stack, Pressure sensitive, or Shrink Sleeve labels for ur craft beer product? Know the difference? Do u like cut & stack, Pressure sensitive, or Shrink Sleeve labels for ur craft beer product? Know the difference?